Back pain is a common complaint, and about 80% of people have some at one point or another during their lives. 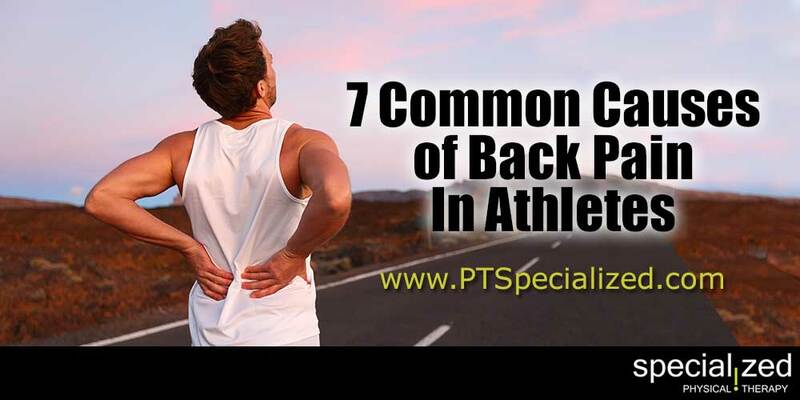 Athletes are at a greater risk of back pain, and there are some common causes of back pain in athletes. One cause of back pain in athletes is musculoligamentous strain, which is a soft tissue injury. Soft tissues are the muscles, nerves, ligaments, tendons, and blood vessels around the spine. It’s the most common injury and is diagnosed by excluding other causes, or by exclusion. While they don’t spread and get worse and will generally heal themselves over time, learning how to avoid what caused it, such as not warming up or improperly doing an activity is the best way to avoid it. Another cause is spondylolysis, which in athletes is mostly found in those who participate in sports that hyperextend the spine. These sports include gymnastics, pole-vaulting, football and weightlifting. The most common symptom is chronic low back pain and it can stem from compressive pressure on spinal nerves. It’s usually treated with anti-inflammatory medications and stretching/strengthening exercises. Don’t take it lightly! It can lead to spondylolisthesis” which occurs when spondylolysis causes one vertebra to slip forward over the one below it. It’s much more serious and can mean the need for surgery. Excessive stress and weight bearing in athletes can also lead to a herniated nucleus pulposus. Once you get out of bed in the morning, everything stresses your spine because of the need to support body weight. The HNP is also commonly referred to as a herniated disc or slipped disc. The herniation means that your nerves get compressed and lead to the symptoms of numbness, pain, change in reflexes or tingling in the arms and legs. If the disc ruptures it releases chemicals that can irritate and inflame the nerve roots, which leads to strong discomfort or pain. Treatment depends on how severe the disc herniation may be. Many of these conditions can be avoided by proper body mechanics and being aware of the risks. If you are experiencing back pain in the Denver area, make sure to come on in for a FREE Pain Evaluation at Specialized Physical Therapy!